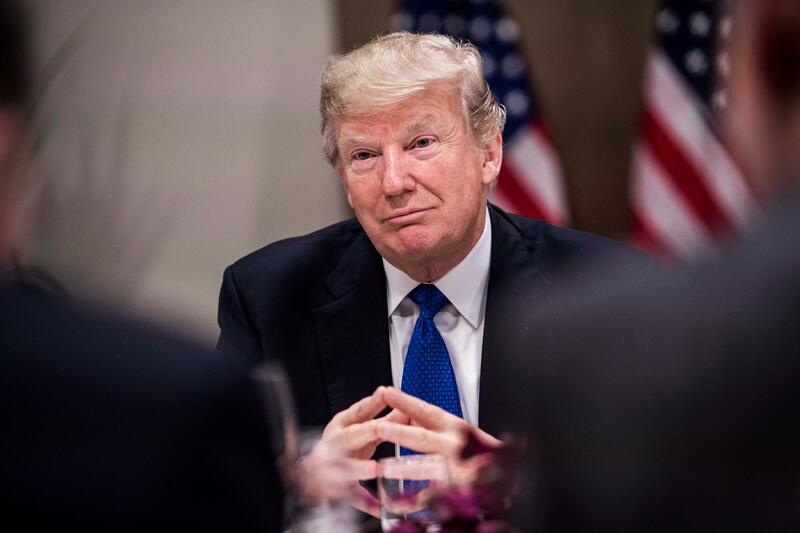 DAVOS -- U.S. President Donald Trump has apologized for the first time for retweeting a British far-right group's videos apparently showing Islamist violence, in an ITV interview aired in Britain on Friday. "If you're telling me they're horrible racist people, I would certainly apologize if you'd like me to do that," he told Good Morning Britain's Piers Morgan during the interview, conducted in Davos on Thursday. Mr. Trump sparked outrage in Britain in November when he retweeted, in quick succession, three anti-Muslim videos posted by Jayda Fransen, the deputy leader of Britain First who was in 2016 convicted of religiously aggravated harassment of a Muslim woman. "Of course I didn't know that," Mr. Trump responded in excerpts of the interview aired Friday. "I know nothing about them (Britain First), I know nothing about them today, other than I read a little bit," he added. "Certainly I wasn't endorsing anybody. Perhaps it was a big story in the U.K., but in the United States it wasn't a big story. I am the least racist person that anybody is going to meet. "When you do those retweets they can cause problems because you never know who's doing it to start off with," the president told Morgan. Mr. Trump was less apologetic about tweeting the content of the unverified videos, saying he was a "big believer in fighting radical Islamic terror." "Radical Islamic terror, whether you like talking about it or not, you look at what's going on in the U.K., you look at what's going on all over the world," he said. "It was done because I am a big believer in fighting radical Islamic terror." The incident caused a huge headache for British Prime Minister Theresa May, who said that Mr. Trump was "wrong" to send out the tweets. Mr. Trump responded by tweeting: "don't focus on me, focus on the destructive Radical Islamic Terrorism that is taking place within the United Kingdom. We are doing just fine!," further souring the "special relationship" between Britain and the U.S. following a series of spats. However, the two leaders met in Davos on Thursday, and Mr. Trump was keen to downplay talk of a rift, with Britain desperate for a trade deal with the U.S. as it leaves the European Union. "The real me is someone who loves Britain, loves the U.K., I love Scotland; very special people and a very special place," he said. "I don't want to cause any difficulty for your country." Turning to May, Mr. Trump insisted: "We actually have a very good relationship although a lot of people think we don't. "I support her, I support a lot of what she does and I support you militarily very much. We will come to your defense should anything happen," he told the breakfast news show. Mr. Trump was due to make a state visit to Britain this year, but recently pulled out of a ceremony to open the new U.S. Embassy in London following the spats, and after it appeared the visit would be met with protests. Mr. Trump said "I don't care" about the potential protesters, adding: "I think a lot of the people in your country like what I stand for, I do stand for tough borders." May spoke to the World Economic Forum in Davos on Thursday, with Mr. Trump set to deliver his address later Friday.